Exloc Instruments are able to offer a high quality competitive range of Intrinsically Safe Sounders & Beacons. The range contains ATEX approved sounders, beacons and combination units in a variety of colours and supply voltages. provides a bright flashing warning signal. Light source: Array of 6 high intensity L.E.D’s. Effective intensity cd: 48cd* – measured ref. to I.E.S. Cable entries: 1 x M20 clearance gland knockout. The IS-mB1 is a compact beacon with an array of six high output L.E.D’s. Approvals include ATEX, IECEx and GOST-R for Zone 0 applications and FM approval for Class I Division 1 and Class I Zone 0 applications. Effective intensity cd: 23cd* – measured ref. to I.E.S. Cable entries: 2 x M20 clearance gland knockouts. There is a choice of 49 alarm tones with 2 remotely selectable alarm stages. The enclosure is marine grade aluminium with a phosphate and powder coat finish for durability in the harshest of environments. Producing a high frequency continuous tone, the IS-pA1 can be pulsed to produce different sounds. Utilising the supplied threaded lock nut the IS-pA1 mounts into a 28mm hole – ideal for applications in control panels where a fault indication or other process alarm is required. The IS-mC1 is a compact combined 100dB(A) alarm sounder and L.E.D. beacon – only one Zener barrier or galvanic isolator required to run both sounder & beacon or alternatively the unit can be operated as individual signals. supply via 28v 300Ohm Zener barrier. 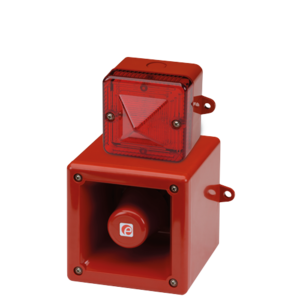 The IS-DL105 unit is an intrinsically safe field mounting combined alarm horn with L.E.D. beacon/light which provides a a loud audible and bright flashing visual signal utilising a common zener barrier or galvanic isolator. The alarm horn features an alarm accept function – by closing a pair of external contacts (i.e push switch) the operator may silence the alarm for set periods between 5 seconds and 2 hours. If after the preset time the alarm condition still exists the sounder will activate again.